Mary Bourne is a local artist who works teaches and exhibits in Britain and overseas. She was commissioned by The Moray Council to design a feature sculpture for the centre of Elgin to depict the history and traditions of Moray. Pictured: Elgin Feature Sculpture: finished works. 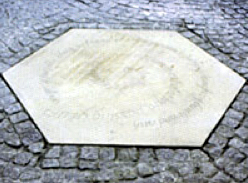 The single hexagonal plainstone sculpture was carved and installed by LTM. 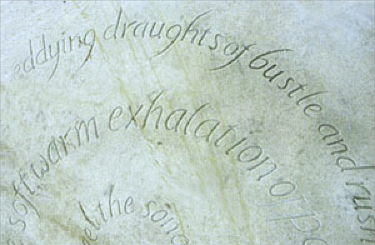 Works included the carving of 136 letters, uplifting existing stone cobbles and installing the sculpture on Elgin High Street.